Map showing location of Sylvia Flats Hot Springs [Destroyed by slip 20 Jan 2017) . Use the controls on the map to zoom in and out. Could no longer find the hot pools...would it be possible to re-dig? Such a shame.....Any way of locating the original source of water? 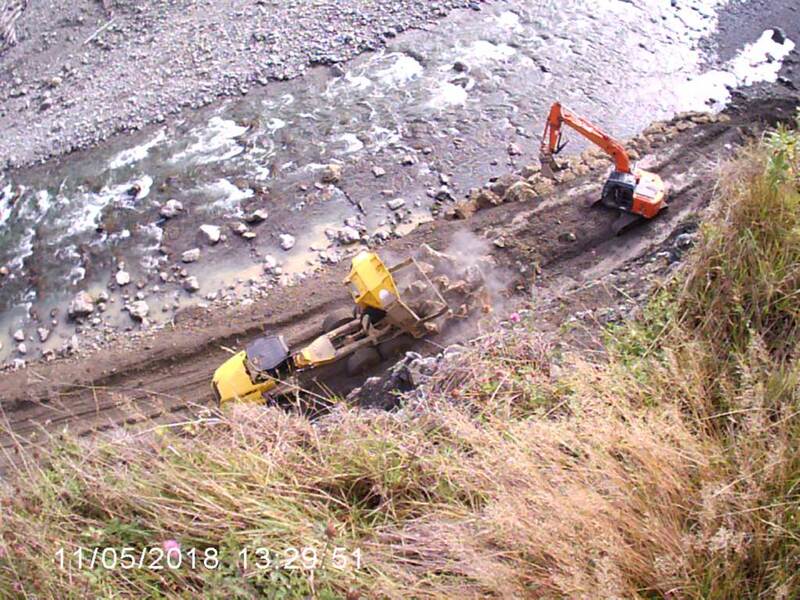 Massive slip decimates Sylvia Flats Hot Springs, Lewis Pass: 20th January 2017 The famous Sylvia Flats natural thermal hot springs that has been a secret haven for locals and their friends for years, has disappeared following a massive landslip in the advent of the torrential rainfalls on the West Coast on 20th January 2017. 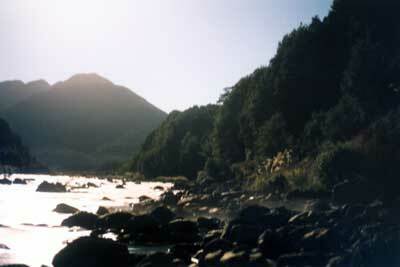 The Lewis Pass region is host to numerous natural thermal waters, many in remote locations accessible only on foot. 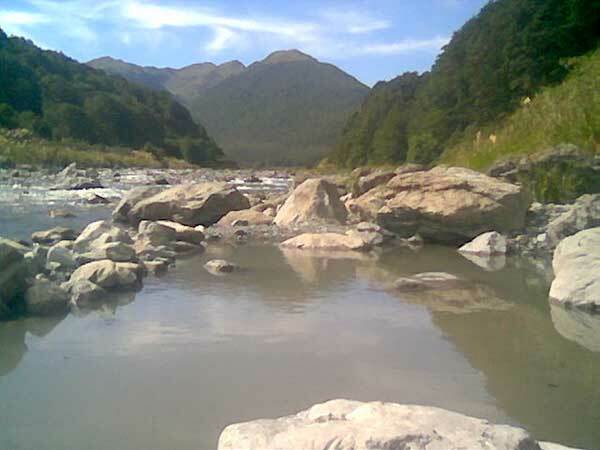 Sylvia Flats is located alongside the Lewis River, 20 kms past the Maruia Springs thermal resort. The weekend's downpour triggered a slip on the side of the highway, completely burying the geothermal pools. The access track from the car park has also completely collapsed . 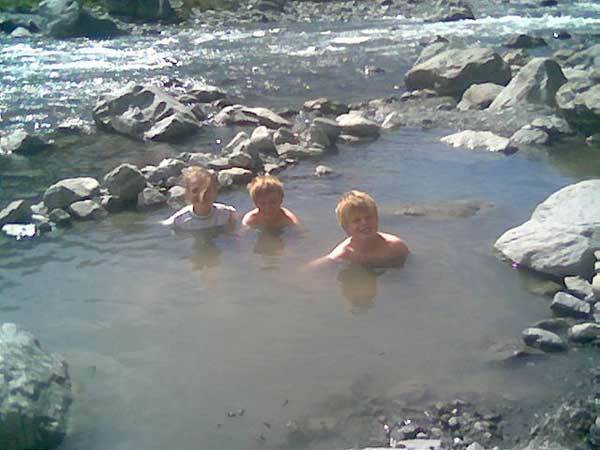 A DOC warning sign has long warned thermal bathers to not use the pools and be mindful of rockfalls, however has not deterred visitors to experience the wonder of the natural geothermal pools, that usually reach 40 degrees. Went there in winter with constant rockfalls from the exposed cliff above. Walk through the river across to the other bank and there are several springs coming up out of the ground. Just take a shovel and be prepared to dig them out. Took 10 minutes and then we were able to enjoy them all day. Springs were warm but not overly hot, more work on creating other pools was underway, the pools are so close to the road and the driving directions are spot on. 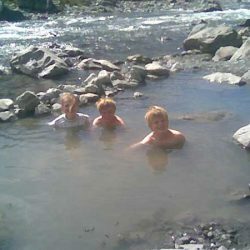 Great to find hot springs so close to the road. They were amazing to lie in as the sun sunk below the hills and the moon shone bright. Shame about the the sandflies and the filthy people who use the bush instead of the long drop to do their business. It is disgusting. a horrible, sandfly-infested murky, luke-warm puddle. lovely surroundings, but hardly worth the effort. don't mean to sound negative, but i'd like to be honest to save others the disappointment and trouble. 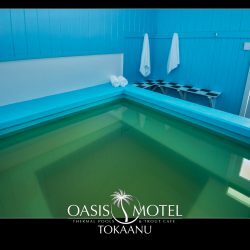 It was fun hunting it out and discovering a real thermal spring in nature, but honestly, if you want thermal pools, just go to maruia thermal resort up the road. OK, it cost $15, but they have 3 huge natural-looking outdoor pools (with rocks and shrubs and stuff) with views across the river and up the mountains and tranquil native bush surroundings. Also various indoor pools and bathhouse. But would not recommend Hamner Springs at all, as it is a municipal facility in the town center, much like soviet-style public pools and is way too commercial and full of wrinkly old folk from the nearby nursing facility. 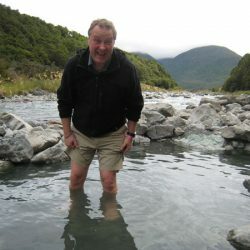 June visit is the answer - no biting insects and water warm enough to soak for and extended period. Cold getting in/out though! Quirky and unexpected. Easy access, and a good point to stop on the road between east and west. 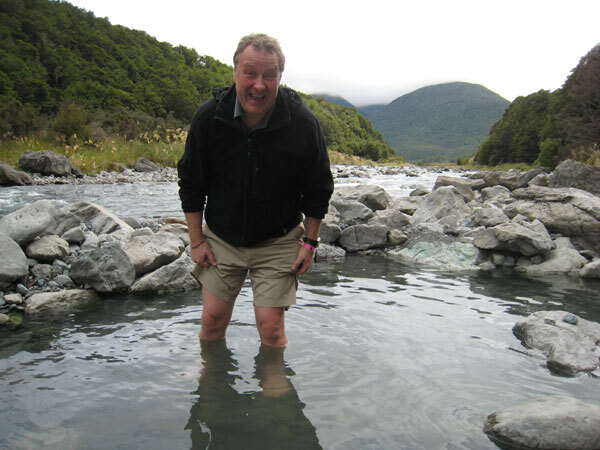 Coming from Christchurch, you pass a sign that says Welcome to the Lewis Pass Scenic Reserve. Just a few seconds after that you see a blue picnic area sign. Turn down a gravel road which has some big pot holes. A picnic area by the river has a toilet at the downstream end. 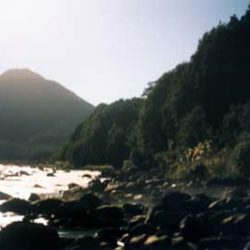 At the upstream end of the picnic area, a track follows beside the river for about 2 to 3 minutes walk to the hot springs which are identified by their mild sulphurous smell. Not hot, just warm normally. Usually one pool big enough for 2-3 people. Sometimes more than one pool. Sandflies are a big problem. DEET insect repellent necessary for the face and any body parts not underwater! 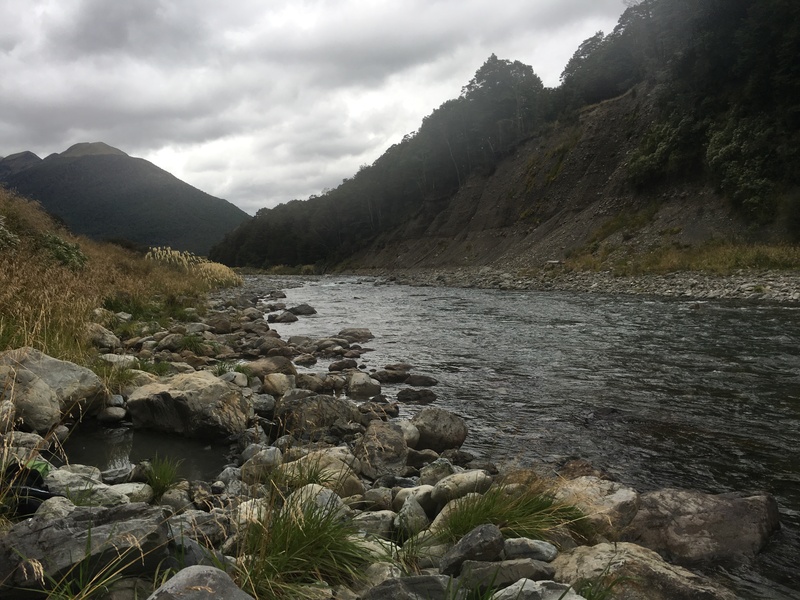 Maruia was closed so tried to find the mythical Sylvia Flats and we were richly rewarded, beautiful natural spot, snow capped peaks, wish the sandflies hadn't eaten my face though! Usually a choice of 3 or more pools which are largely maintained by members of the Deerstalkers Assn. Lots and lots of sandfly's - repellant a necessity. Pools recommended just for the hell of it - great in Winter with snow. the only 'pool' (Aug 2014) is ankle deep and about 1m by 1m. would need some digging out to be worth getting changed. the land slip is covering the area upstream of the pool, presume this is where the original pools are. Pools are currently a few small pools. Directions coming from Christchurch are perfect, but there is no sign for picnic area, just a dirt track. Best to follow it as far as possible upstream, then walk upstream along the river for 100 meters or so and you will see the pools. Not too deep and it is sandfly heaven as expected! 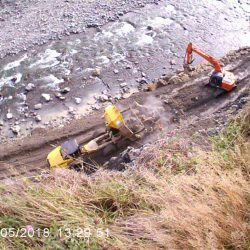 been there several times over the years.So handy to the road when going via the Lewis..sandflies are murder!make you get undressed & into the water very quickly!! i give it 10 out of 10 for the location, and only at nite as its safe without any sandflies and its heavenly! This place was introduced to me as "Sandfly Flats" for good reason. I have been to that pool many times, liberally covered with repellent to minimise the biting. It makes for a welcome stop on the road to/from Nelson. Located in riverbed on the trueleft of the river. 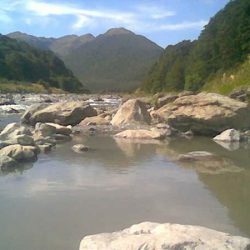 The pools are quite shallow and require redigging after flooding of the river. The best way to enjoy this pool is to drape yourself in a mosquito net before getting in, otherwise you will be driven mad by the sandflies. S42.49034 E172.38672 Well worth it! 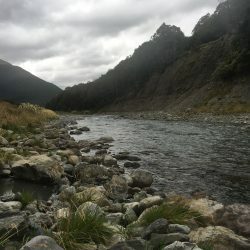 Lovely, isolated small pools, surrounded by beautiful New Zealand bush and mountains, with a stream running right beside it. Very well worth it! Would definitely recommend these! Source: The cliff face on the highway side of the river is too dangerous to use the pool there. We formed a pool on the other side of the river opposite the parking area which is big enough for 2/3 people. Water was Hot.